Mangaluru, Jan 25, 2017 : Sri Samsthan Gokarn Partagali Math is all set to induct a disciple to its seer Srimad Vidyadhiraj Thirtha Sripad Vader Swamiji. The grand ’shishya sweekar’ will be held at the Sri Samsthan at Partagali, Canacona in Goa on the banks of the Kushavati on February 9. The disciple is Uday Bhatt, second son of Vedamurthy Laxminarayana Bhatt of Belagavi. He was a student of engineering prior to this religious calling under the guidance of Sri Vidhyadhiraj. Well nurtured by his parents from childhood, he is a ’vatu’ of few words, virtuous, sharp-witted, with sharp grasping power and inclined to religion. Accepting the invitation of the Sri Math, Uday Bhatt came to Partagali Math and through pandits there, got acquainted with Vedas and pooja rituals useful for ’sanyasashram’. He is currently studying poetry, grammar and logic. The religious rituals in connection with ’shishya sweekar’ will start on February 8. Srimad Vidyadhiraj Thirtha will give him the ’Pranav Mantropadesh’ on February 9 at the auspicious muhurath of 9.22am. The 360-year-old math will stand testimony to this event. Religious functions of sanyasashram, shishyasweekar and traditional ceremony will be completed in these two days. Thousands of devotees of the math from Goa, Karnataka, Maharashtra and Kerala will be attending the event and all arrangements have been made for them. The central math committee, organizing committee and sub-committees are doing their work under the guidance of the swamiji to make this important celebration grand and memorable one. The Math has a traditional system of selecting ’shishya swami’ and it has been followed. The math was established at Badrikashram in the Himalayas in 1475 AD. Sri Narayan Thirtha Swami established the math that has completed 541 years as on day and has seen 23 religious heads. From Badrinath down to Mumbai, Bengaluru, Karnataka, Kerala and Goa there are 33 branches of the math with the main math at Partagali. 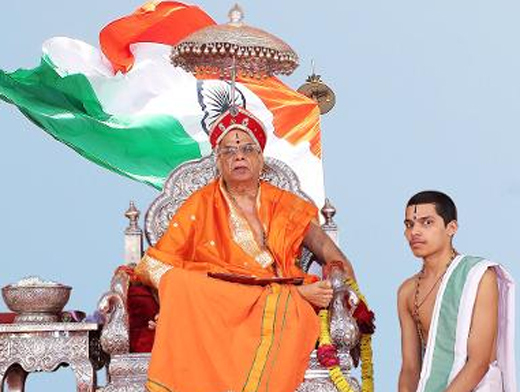 Srimad Vidyadhiraj Thirtha presently in his 44 years of tenure as ’Mathadipati’ has worked for unity of the Samaj by teaching religion and values. During these 44 years, the swamiji has set up matha vastus and kalyan mantaps wherever needed, started health centres and old age homes besides discharging his religious duties.